For centuries, Buddhist monks used this green tea powder, rich in natural antioxidants, to focus during meditation. Now this phenomenal superfood, one of Japan’s best-kept secrets, is growing increasingly popular, appearing in everything from bread and brownies to candy and lattes. Matcha shots were everywhere during New York Fashion Week in 2015, and, because of its caffeine content, matcha might soon replace your morning espresso. 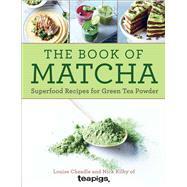 The Book of Matcha features more than 40 inspiring dishes that show how you can use this incredibly versatile, antioxidant-rich ingredient at home. Kick-start your day with a Breakfast Booster Smoothie or Chia Seed and Matcha Power Pot. Add some Asian flair to lunch or dinner with Matcha and Butternut Squash Gnocchi or Matcha-Spiced Fried Chicken while sipping a delicious Matcha Mint Iced Tea or Chocolate Matcha Milkshake. Then kick back with a Matcharita or Matcha Martini. A wealth of information on the history, production, and health benefits of this nutrient-packed superfood make this your definitive matcha resource. Louise Cheadle and Nick Kilby are the owners of international tea company Teapigs. Teapigs products can be found in the US in various Whole Foods Markets, the Fresh Markets, and other premium retailers, and they have just launched a direct-to-ship program to customers in the US. Louise and Nick are based in the UK, but have teams in the US and Canada, as well.